"For over a year The Guardian has been trying to contact Steele, 68, to ask him about his role during the Iraq war as US defence secretary Donald Rumsfeld's personal envoy to Iraq's Special Police Commandos: a fearsome paramilitary force that ran a secret network of detention centres across the country – where those suspected of rebelling against the US-led invasion were tortured for information. 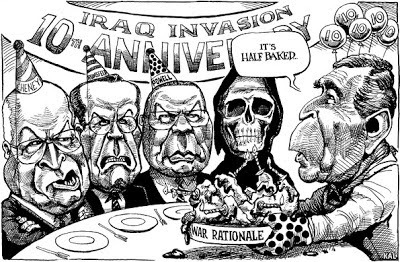 On the 10th anniversary of the Iraq invasion the allegations of American links to the units that eventually accelerated Iraq's descent into civil war cast the US occupation in a new and even more controversial light. The investigation was sparked over a year ago by millions of classified US military documents dumped onto the internet and their mysterious references to US soldiers ordered to ignore torture. Private Bradley Manning, 25, is facing a 20-year sentence, accused of leaking military secrets." 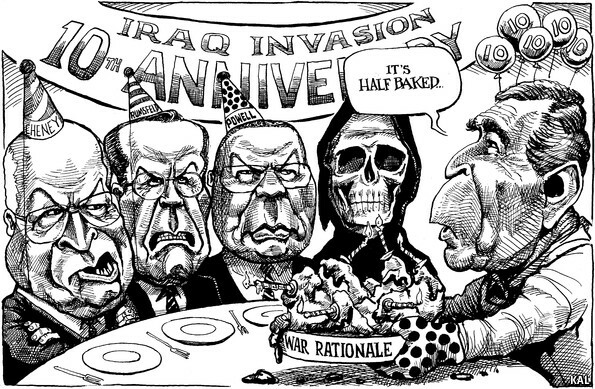 This cartoon is from The Economist (look here). And it comes out just in time to accompany these stories from The Guardian further implicating Don Rumsfeld and other BushCo higher-ups in crimes against humanity    . Apparently, Rumsfeld sent "Colonel James Steele, a retired special forces" officer to Iraq to coordinate Shia' paramilitaries to fight Sunni resistance to the U.S. invasion. The paramilitaries served as death squads, and operated torture centers, all under the supervision of and with funding provided by Steele reported to Rumsfeld. We know who Rumsfeld reported to. It is alleged that Steele's collaborator Colonel James Coffman (ret) reported on their activities directly to David Petreaus. No "bad apples" excuse here. As the passage I've lifted above makes clear The Guardian reports are grounded in the documents disseminated by Bradley Manning. No wonder the Obama administration is so intent on prosecuting him. Mass murderers in the military are awarded full honors, civilian murderers can get off in 8 1/2 years with good behavior, political prisoners who defy the government- life.